Decisions, decisions, decisions, cause much consternation and anxiety. Which course do I take? It’s hard to prioritize when choosing the right course of action especially when you throw in what will please your family, your colleagues or your friends. Making others happy is usually a fool’s errand. What is fine with one person sets off a war with another? Wouldn’t it be wonderful if we had only one person to please? 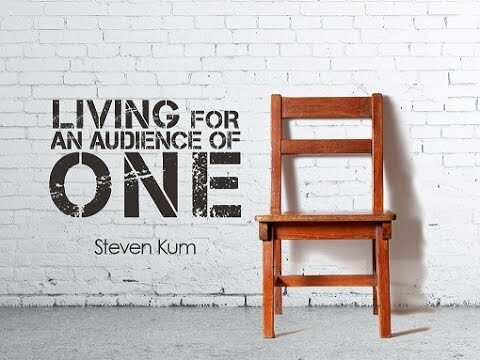 We truly only have an audience of One. There is only One Person we should concern ourselves with pleasing. The stress and strain of life emanate from attempting to please everyone. People pleasers live a heavy laden life filled with frustration and rejection because efforts to keep people happy cannot be accomplished. Not rocking the boat to keep confrontation and displeasure at bay only results in stagnation and failure to move toward your ultimate destination. When decisions are made based on pleasing God and keeping the relationship with him intact, you will find yourself doing His will in His way. Joy and peace will pervade your life. Yes, it is wonderful when all you need to do is please just One.